Hi all! Hope you're all doing well. Typically I don't post about my personal life on the blog, unless it pertains to organizing, creating, decorating or some crafty thing. My news today does to some degree, because soon I'll have to re-do and re-decorate a few of our rooms. Because guess what? We're having a baby! Yep, it's true. I'm pregnant! A little one will be joining our family in March! We are excited and a wee bit nervous for the changes that a new little one will bring to our home. We've been out of the baby stage for 5 1/2 years now, so it'll be interesting to go back to it. I wanted a fun and unique way to announce my pregnancy to family and friends, so I did a bunch of web surfing to find a little inspiration. There are so many adorable ideas out there!! 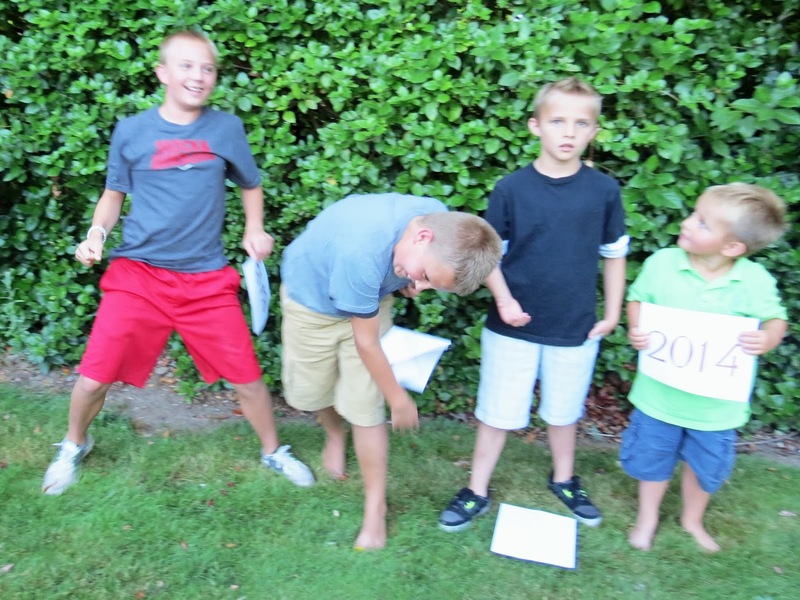 We found our "photo spot", lined the boys up and while I had the camera in hand, daddy passed out a piece of paper to each of the boys with the news typed on the pages. They just had to put it all together. Look at their faces, each one with a different first reaction. and posted this photo on my personal Facebook page to tell the rest of my family and friends. It was fun to announce my pregnancy like this. It was also fun trying to decide on how exactly to do so. So if you're expecting and you're not sure how to announce it, I hope this post gives you some ideas. For me, now I get to go and search for inspiration on unique ways to announce baby's gender. Just a few more weeks before I know if ours is another boy or a little girl. And YES, I will let you all know. So fun! Congratulations. I love the different expressions on your other kids faces. Thanks for sharing the Fairy!!!! I loved the photos of your boys!! I smiled all the way through this! The expressions are priceless. 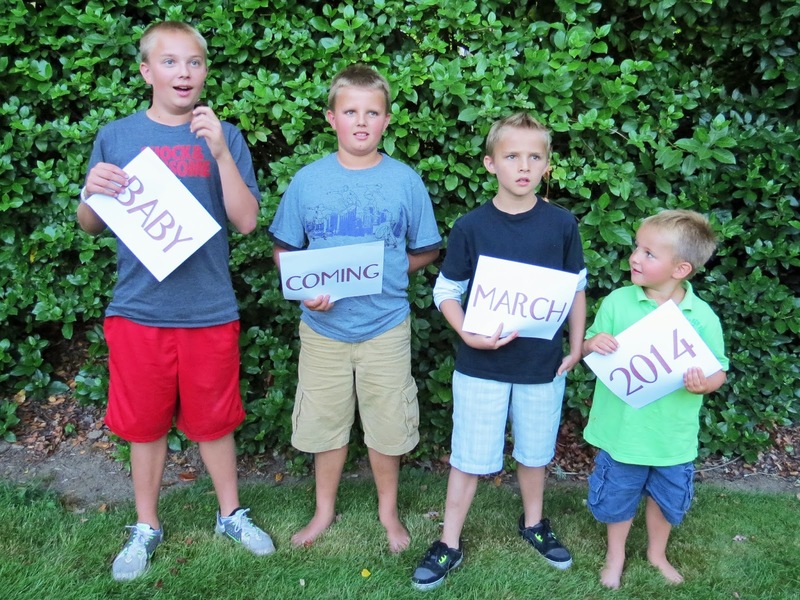 Congrats to you and your family of boys...I will be secretly hoping for a little girl, ha! What a great way to let your boys learn the news. Love their expressions! Congrats to you and your family! How fun! Congratulations on your newest blessing. Our last baby was born when our previous "baby" was 4 1/2. We have 11 children (10 biological), most of which are 2 years or less apart. I would say, "As long as they coming before I give up the diaper bag, we'll be fine!" But then, when I truly thought we were finished (and had, in fact, settled into my role as "grandma"), we discovered we were expecting AGAIN! That baby boy just turned 4 and he is such a wonderful blessing to our family! Such a great roundup. And congrats on your pregnancy! I know your hoping for girl, right? 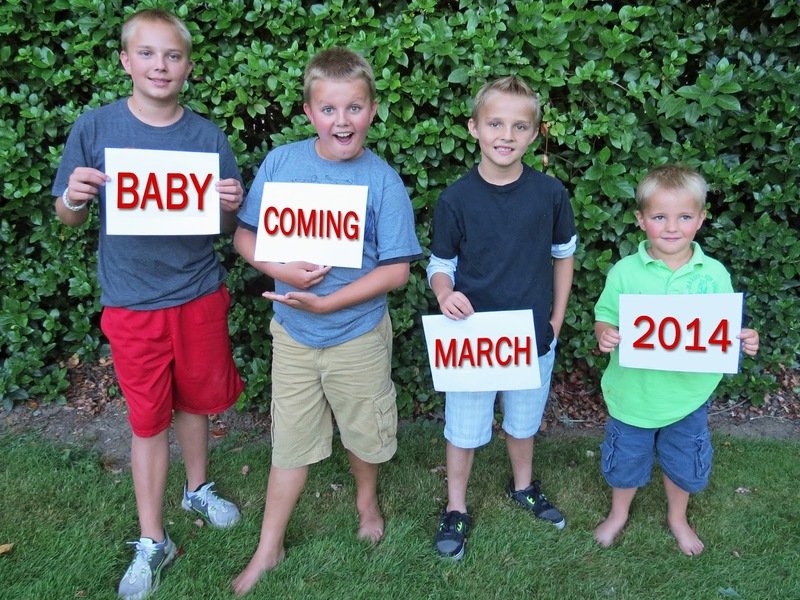 Four boys and a girl sounds good to me. Every mom needs a daughter! My wishes for you are an easy pregnancy and healthy wee one. BIG CONGRATULATIONS!! I look forward to watching you decorate the nursery!! Your boys are just precious! Love the expressions on their faces!! Wishing you a healthy and happy pregnancy. Congratulations!! That's awesome news! Loved the pic of the boys when they found out!! Thanks for sharing your "big" news. I agree, the faces on the boys are brilliant! I love your creativity in announcing your newest blessing. You will have some good helpers for sure. Congratulations! Your boys are so handsome! Love the expressions of the boys. I'd love to see a family pic with your whole family. What a good looking bunch! Congratulations! You have a beautiful family:) Hope you can get some rest and feel good through the rest of your pregnancy. Best wishes!